One of the most popular podcasts at www.themotoworld,com we have done of late is titled “All news, All the time…Well kinda”. It was fun to do because there is so much happening in the roadracing world right now. A new organization with new rules, some manufacturers not wanting to play, new riders on new bikes, a spec tyre program in both AMA Pro Racing and MotoGP, a potential for International rules for National series. Let’s start with AMA Pro Racing vs. the ‘Big 4’, Honda, Kawasaki, Yamaha and Suzuki. The final rule changes for the 2009 racing season were announced last week and three out of the big four were not happy. In the past, only one has been annoyed. The details of the rules can be found at other websites such as www.roadracingworld.com so I won’t get into them here, but the gist of it is that it all started with a change of tire sizes and fuel tank alterations that Kawasaki was not happy with. Honda decided to follow suit and the Yoshimura Suzuki joined in. Yamaha said “we’re going racing”! Well, this coming weekend is the Daytona Tire Test. Usually a big event. I wonder who’s going to be there? And still more from the soap opera we lovingly call AMA Pro Racing. President Roger Edmondson has made a big deal about the fact the rule changes coming forth are designed to make the racing better by leveling the playing field, or race course as it were. Spec tyre’s, horsepower limitations ala Moto-ST, which he also runs and is doing quite well and new homologation rules for aftermarket parts. There has been and is still a lot of unhappiness about all the various changes. Mr Edmondson is trying to get more motorcycles from more manufacturers on the grid. Good for him. I think we all agree that we would like to see the likes of Ducati, Aprillia, KTM, Buell and Triumph alongside the Big Four. Here is where it gets a bit interesting. In the “Middle Weight” classes, AMA Sportbike and AMA Supersport, we could see a VERY wide range of machinery on the track. For the 2009 racing season we will see the 600CC bikes from Honda, Kawasaki,Suzuki and Yamaha but…also the Triumph Daytona 675, Buell 1125R, KTM Superduke, BMW1200ccHP2 and the Ducati 848. Would make a very interesting and exciting field don’t you think? I do. But wait, what’s wrong with this picture??? 1100 and 1200 CC motorcycles against little’ol 600’s? It’s been done before. But that was back in the day of two big heavy, two valve aircooled cylinder motors, not lightweight, high performance, liquid cooled four valve motors. And,why is Ducati limited to 848CC?? I must be missing something here. Let’s get a small picture of how this looks. Based on press releases available to all; the Buell 1125R comes from the factory with 146HP and 82 Ft lbs of torque, ok, cool. The Honda CBR600RR comes to the party with a paltry 105HP and a meager 46 ft lbs of torque, poor little Honda. So, the question is now, how is this a level playing field? I’m not sure, but it might make for some very interesting racing. This entry was posted in Helmet Time, motorcycle racing on November 30, 2008 by themotoworld. This has a been a tough year. Losing friends and motorcycles, motorcycles are friends too actually. I found out yesterday that the man that caused my sickness…riding and racing motorcycles…passed away a while back. Michael was born in 1935, took up flat track racing in the early 50’s, and roadracing a little later. The pictures of he and his brother racing back then are great, I wish I had them. Michael took me under his wing in the mid 60’s and created this monster that has lived in me ever since…the love of motorcycles. We raced in the California Desert together for a few years, rode every twisty road in Southern California and destroyed a few motorcycle’s along the way. I have numerous memories of time with my step dad…some good, some not so good and some just plain memorable. 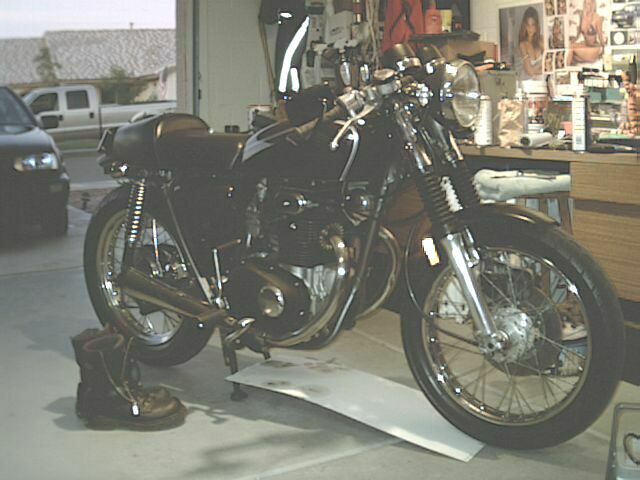 I learned to figure out how to get a motorcycle running again when you’re stranded in the desert or on a Highway in the middle of nowhere, how to tune a motorcycle by ear and why Triumphs are the best motorcycle’s ever made…well, I still own one, so I guess he taught me well?? 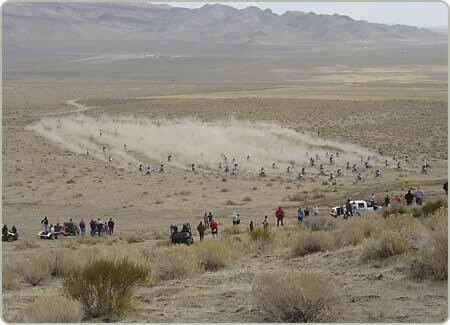 A favorite memory I have comes from the trip home from a race in the desert. Just your basic ‘Hare and Hound’, 100 miles across the Mojave, but..it was my first trophy..third place in the ‘Open Novice’ class. I was on top of the world. The day got better…we were passing the old ‘395 Cycle Park’ in Adelanto, California where a TT race was going on. We stopped to watch a bit and I ended up getting a chance to ride in the TT on a Bultaco Astro 250, too much fun. I didn’t do all that well, but I followed my basic race philosophy…don’t crash and don’t be last, I succeeded. It was a really hot day in the desert and what is always great on a hot day?? A cold beer! Two guys covered in dirt, in an old truck with a couple of beat up motorcycles in the back and one of the guys is only 17. Let’s stop at the next roadside bar we see. The Rocket Inn. A dive outside of town, people that have been sitting at the bar since opening time (6AM), a really bad jukebox, really cold beer and no ID required. A great end to a great day. It is a great memory. Oh, and the really, really good part, I beat my step dad in the race…by a long way!! This entry was posted in flat track, Helmet Time on November 20, 2008 by themotoworld. Only thirty eight days to Christmas… so start saving your pennies because I know what I want under the Christmas tree. Now, we’re all gearheads here and we love tools, how can you go to Sears, Lowes or Home Depot and not head for the tool section?! It would sacrilegious! That’s when the wife takes my credit card away. Some of the better motorcycle shops have cool special tools as well. Motion Pro goodies are especially dangerous. Then there are catalogs like Rider Wearhouse, Dennis Kirk, heck, even JC Whitney has some neat stuff. Being a gearhead is a sickness cured only by more tools and as ‘Tim the Tool Man’ says…”More Power”. Well, I think I have stepped over the line. Here at The Motoworld International Headquarters we are putting in a new driveway. 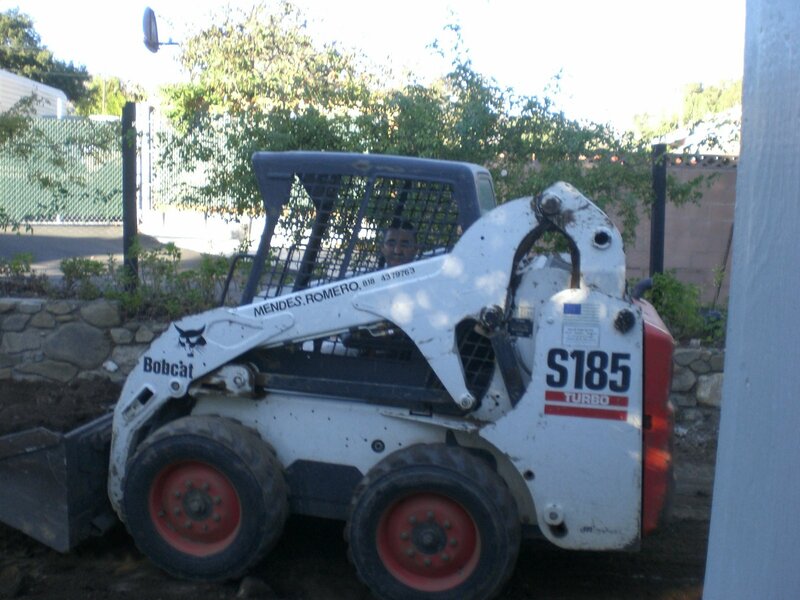 The contractor doing the work showed up with a crew, a big truck, sledge hammers, pick axes and…a Bobcat! You see them all around at job sites but when you see one in your driveway doing it’s job, well… It does everything, turns tighter than a MotoCross bike, can lift that MX bike ten feet in the air and with the right attachment it can transport a Gold Wing across town. This entry was posted in Helmet Time on November 17, 2008 by themotoworld. As most of us do, we subscribe to different mailing lists and forums. For me, it’s the Bevelheads (vintage Ducati’s),The VJMC (vintage Japanese bikes),the Hinckley generation Triumph list (the new stuff from Triumph)and a few more for motorcycle business stuff. This last week a topic on the Triumph list came up that brought up reliability issues of Triumphs. Now, the new Triumphs are so good that the only issues that could be brought up were regarding older Brit Bikes. I and a couple of other list members were accused of trashing and slamming old bikes. It was all based on a couple of comments about unreliability. 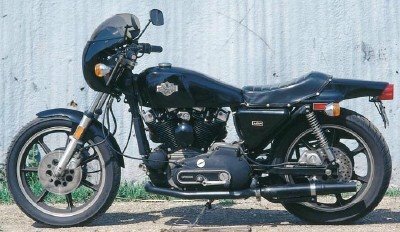 Hey, we all know that motorcycles of the 50’s through early 70’s American, English, Japanese, left a bit to be desired in the reliability column. Good jokes about Lucas Electrics being the Prince of Darkness…’Jap Crap’and if you add in the AMF Harley days..you know exactly what AMF means…Adios Mother F….R. I’m sorry I hurt this guys feelings but oh well. So today I wanted to do a quick post about old Triumphs again. My step dad, who I blame for my sickness…loving motorcycles and in particular English motorcycles, started me on a little Yamaha dirt bike, moved me to the Bultaco, to a Honda 350, a Triumph Bonneville, then a BSA Lightning 650…on and on..In between all those bikes I was allowed to ride his 1952 Triumph Speed Twin. Only once in a while but I did get to ride it. I learned a lot about motorcycles with that bike. How to cut your own clutch plates out of cork, replacing a primary chain and servicing a ‘sprung hub’ style …suspension?? Early on in motorcycle history, the frames were rigid. Something of a front suspension was there and the rear..well, the seat had springs on it like an old tractor, but that was it. Then came the sprung hub…in the center of the rear wheel the hub had springs built into the wheel..a very ingenious design…didn’t do much, but was better than a rigid! I know Vincent had an incredibly modern suspension, way ahead of it’s time in that period, look at a Yamaha Mono Cross suspension of the Seventies and you’ll see how modern a Vincent was! One of the poster’s on the Triumph list extols the virtues of his Vincent on a regular basis..and I envy him a lot!! So, the point of this little story…modern motorcycles are so reliable you don’t have to think about them hardly at all. Older bikes, and I don’t care where they came from, needed love and attention. Many of us learned the lesson…ride it for one hour, work on it for two. We may look back and criticize them for unreliability and sketchy handling, but those of us that rode them then and still do, learned about taking care of your motorcycle so it would get you there and home again. I hope you get the opportunity to spend some time with an older motorcycle, learn to clean and set points, adjust the timing and your clutch, tune the spokes on your wheels, tickle the carbs just right so it starts on the first or second kick and to love the sound and feel of an old motorcycle. Besides all that good stuff…they’re chick magnets!!! even for us old guys. This entry was posted in Helmet Time on November 15, 2008 by themotoworld. When you could go out riding in the mountains and deserts with your friends, ride a Hare and Hound or an Enduro. Few fences, no Sierra Club and only a few endangered species of plants and tortoises. Times have changed, haven’t they? The other day while reading through postings on one of the mailing lists I subscribe to I came across a great photo gallery that brought back a lot of special memories.http://www.flickr.com/photos/bcgreeneiv/sets/72157600755463552/show Vintage photo’s of desert racing and enduro’s from the fifties through the seventies. It’s really great stuff. Great racing, trail riding, sand dune riding, friends and family. All the best of riding a motorcycle. Looking at those pictures got me to looking at my own history. I started my racing career in 1968 in the Mojave Desert with my step dad. At the time he was riding a Triumph 500 twin. Basically a stripped down street bike with semi knobby tires, a skid plate and straight high pipes…commonly known then as a ‘Desert Sled’. Big, heavy, fast and ridden by manly men, ninety pound weaklings need not apply. Now, I wasn’t a ninety pound weakling but, those things were beasts. Fortunately my step dad wanted me to have fun. So instead of torturing a sixteen year old novice on a big heavy bike, something lighter was on the shopping list. 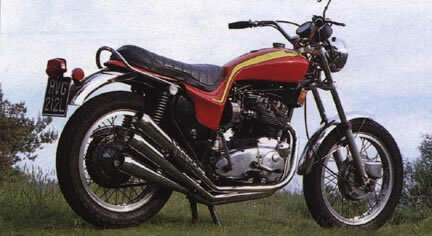 I started on a Bultaco 250cc Matador. . That Matador was great fun. With the lights attached, it was street legal and I could ride it anywhere, pull the lights and it was my race bike. Bultaco’s weren’t what you would call the most reliable bikes in the world…I mean hey, it only stranded me in the desert, uh…four times,um, maybe six?? but I loved that bike. This entry was posted in Helmet Time on November 11, 2008 by themotoworld. I love Cafe Racers. I have written about this before and talked about them on our Podcast. My good friend Erik is way into them (check out his blog at caferacers.wordpress.com). Almost any bike can be turned into a Cafe Racer. But…what is a Cafe Racer? I’m glad you asked. A Cafe Racer is more than just a modified motorcycle, it’s also a type of motorcycle rider. The roots of a Cafe Racer go back to a British counterculture of the 1960’s. Did you ever see the movie Quadraphenia? The Mods and The Rockers. The Mods on their scooters…highly modified and stylized and The Rockers on their motorbikes…highly modified and sylized. Your basic culture clash of the 60’s. 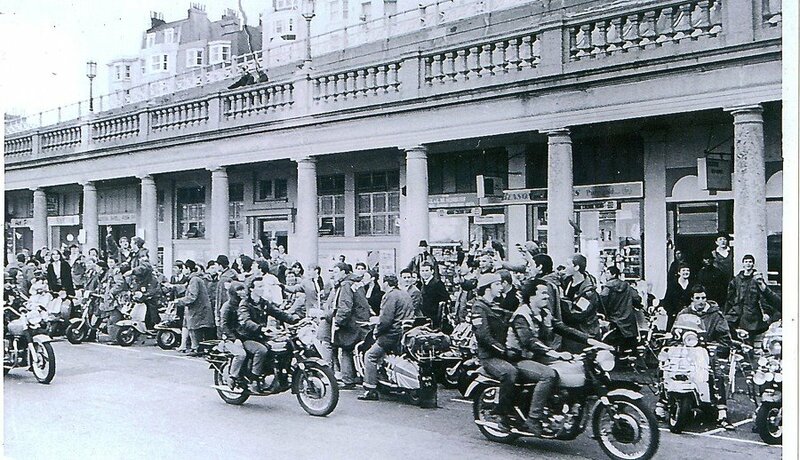 Both groups arrive at Brighton Beach, England for holiday. A brawl ensues …arrests are made, bikes and scooters destroyed. But wait, these guys were basically doing the same thing to two wheels, just a bit differently. The Mods were into modern music and style… picture The Beatles; The Rockers into classic 50’s American Rockabilly and leather jackets…picture Fonzie on the TV show Happy Days. The origin of the Cafe Racer culture is really interesting. Post World War Two, soldiers coming home with some cash in their pockets and buying motorcycles. In Britain it started as a contest between riders sitting in a cafe drinking coffee, bragging about how fast they are…the race was on. But, this race was a bit different, it was not two riders on the road racing each other, that’s too easy.. This race was one rider racing against… the song on juke box in the cafe??! You pop your nickel into the juke box, pick a song, run out the door start your bike and ride to a designated turnaround point and back to the cafe before the song ended. Crazy indeed. Back at that time most songs were only about 2 to 2 1/2 minutes long and the roundtrip was somewhere around 3 miles. Do the math. You had to be riding really fast, usually over 100mph to make it back in time. That my friend is where the phrase ‘doing the ton’ came from. The ‘Ton’ was 100mph. Enough of Cafe Racer culture education, I want to build one. So, how do I make a Cafe Racer? The basics are strip it of everything that is unnecessary. The lighter the better. 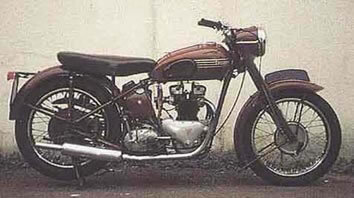 Here in the USA that is how ‘Choppers’ got started, on The Continent (Europe) it was the Cafe Racer. I need to add here that there is ONE, count ’em, ONE American Cafe Racer and it is the only Harley Davidson I would love to own…the 1978 Harley XLCR. 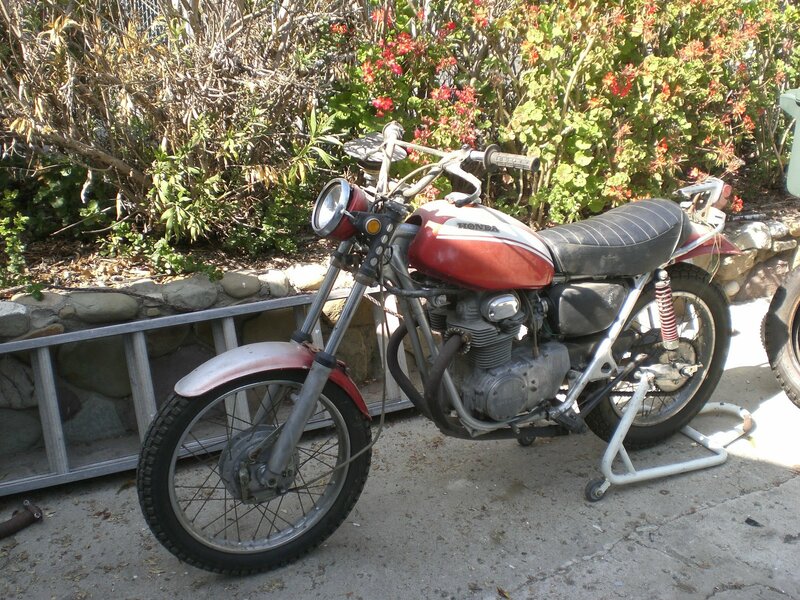 I’ll start with this little old Honda SL350..why the SL?? Well, first off…it’s because I have one that runs great and no one wants to buy (it’s been on e-bay and Craigs list for a while) and because it has a double down tube frame instead of a flimsy single tube chassis, a steeper steering angle for quicker steering and it’s kick start only..very vintage and the cool factor is higher. Drop in a CB front end so I can easily stick a better 18″ front wheel and tyre combo. Fork mods are easier on the CB as well. From there it’s simple stuff like brake shoe upgrades, better shocks, a set of clubman handlebars and a cool paint job. My friend Erik is also going to build one out of the spare parts that I have. We’re going to make a contest out of this…looking at what he has to start with…and what his vision is…his will be cooler for sure. But I’ll be riding mine a lot sooner. Good luck Erik. Back to the original question…can I make this out of that??? I’ll keep you posted. Should be a fun winter project. This entry was posted in cafe racers, choppers, Helmet Time on November 7, 2008 by themotoworld. 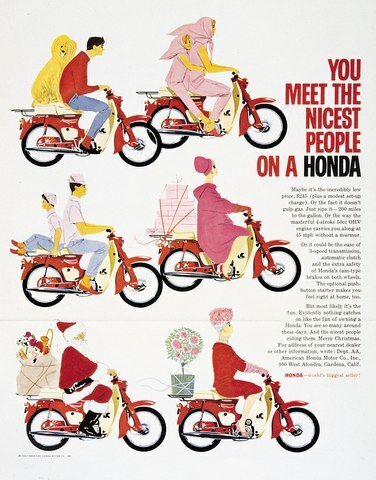 First, I have a Honda Cub…not just a Cub, a ‘Super Cub’!!! 1959 C110. A whopping 55cc, I think about 8 horsepower..I’d bet on the 8 horses in a race however…second,my daughter learned how to ride a motorized two wheeled vehicle on that little motorbike, she made her basketball player (read, TALL) boyfriend ride passenger on it and thirdly…my friend Terry (who sent the article) crashed our little Super Cub in a garage at Willow Springs. It was the first time she was on a motorbike..I guess I wasn’t a very good teacher. Sorry Terry. The little Super Cub was the coolest little pit bike at Willow Springs..going for gas, new tires, lunch, visiting friends…it didn’t matter, the little Honda was always there. 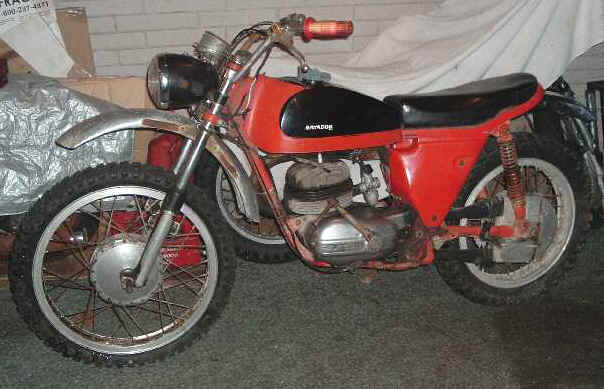 My friend Jay (another derelect 500cc singles racer) had a Bridgestone 50cc pit bike. We used to race around the access roads of Willow Springs between races for fun..that’s how we met World Champions Eddie Lawson and Wayne Rainey one day. They were racing Go Karts on ‘The Streets Of Willow’ course,but,that’s a story for another time. I still have that little motorbike..needs a battery, but other than that, it runs great. It’s been sitting in my barn for about four years now. My daughter moved home recently and receiving the article got both of us to thinking…for puttin’ around town, to the grocery store, the auto parts store, Radio Shack…nothing better than the little Super Cub. A high ‘Giggle Factor’ ride if there ever was one. As you can tell, it needs a bit of TLC. OK, a lot of TLC. I’m having a guilt attack right now about that little bike, so I think I’ll go out to the barn and get the ‘Super Cub’ back on the road. I’ll keep you posted. 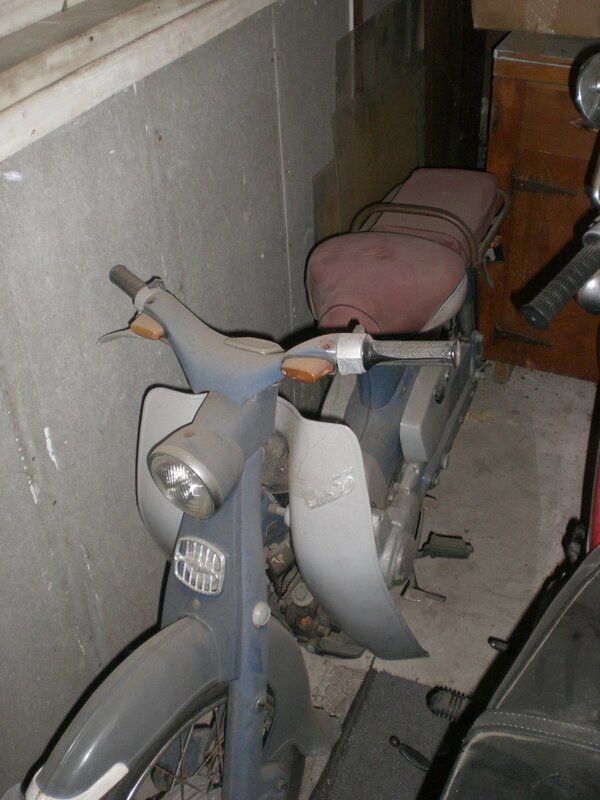 You know what..I need to cruise E-Bay first to see if I can find a basket to put on the front…how cool would that be! Have a good ride today and don’t forget to vote tomorrow. This entry was posted in Helmet Time on November 2, 2008 by themotoworld.